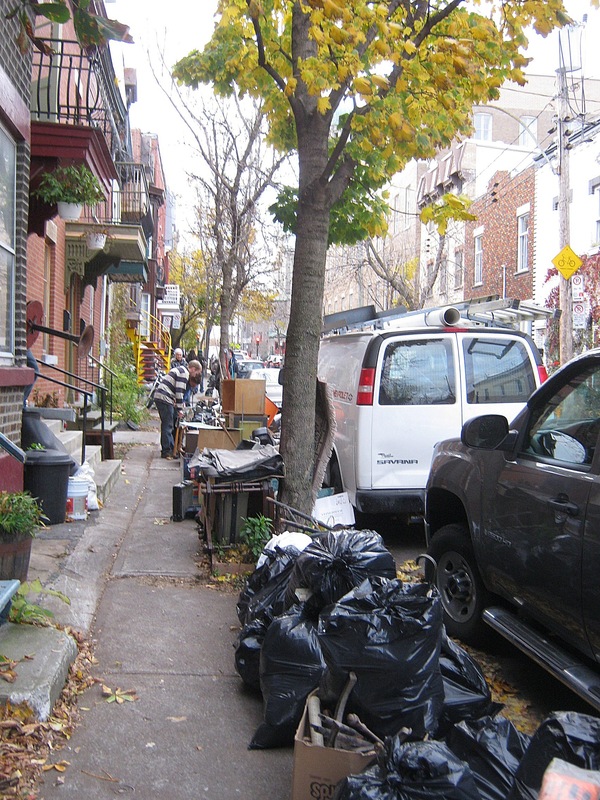 Yesterday I took a walk, partly to look around for trash and partly to feel the strong gusts coming from “Sandy.” There wasn’t much to see for quite some time to start, but coming across this pile of stuff made up for it. I got the back story from the people bringing out the stuff: an older man passed away and his relatives had to clean out his place at the end of the month. He ran a craft store in downtown Montreal and his name was Nick. It seems that he was a bit of a hoarder, which one person I talked to (although I didn’t really trust him too much) thought began after his marriage broke up years ago. I wasn’t the only person looking through this pile of stuff, which Nick’s relatives compared to a “sidewalk sale.” The relatives went out of their way to encourage people to look through the stuff and went out of their way to offer me things. They seemed to recognize that there were valuables in among the trash, but for whatever reason didn’t seem especially interested in trying to sell it themselves. I had some good lighthearted talk with the family members. They said I was their “favorite” of the garbage-pickers, noted that I was definitely the “most patient,” and hoped that I found all the best stuff, all of which I thought was pretty funny. I’ll get to a bit more storytelling as I unveil the stuff I brought back, which I’ve spent most of the day cleaning. For now, I’m just going go against tradition and show you the best first, which I mean to emphasize the awesomeness of this find more than to disrespect the other things. 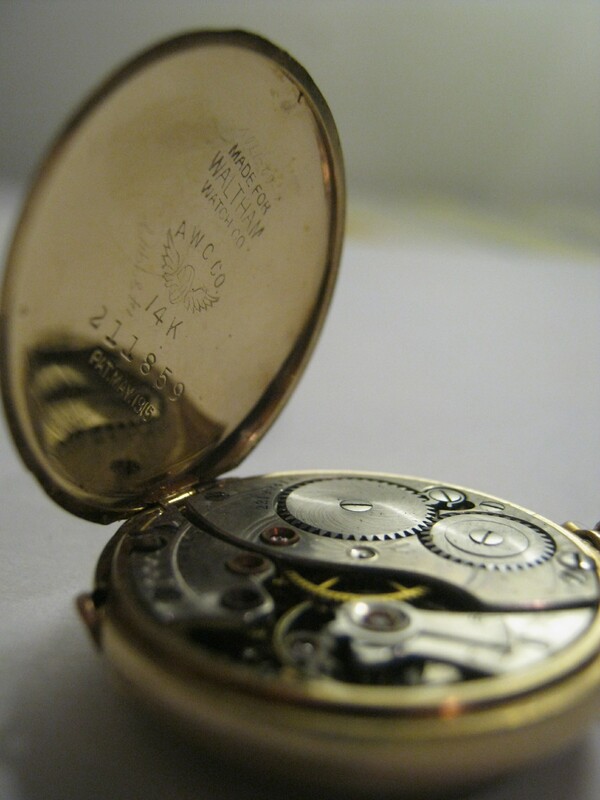 This is a 14k gold “Waltham” pocketwatch, which the numbers engraved on the inside (and the certificate of authenticity) indicate as being made in 1918. And here’s the kicker – it still works! 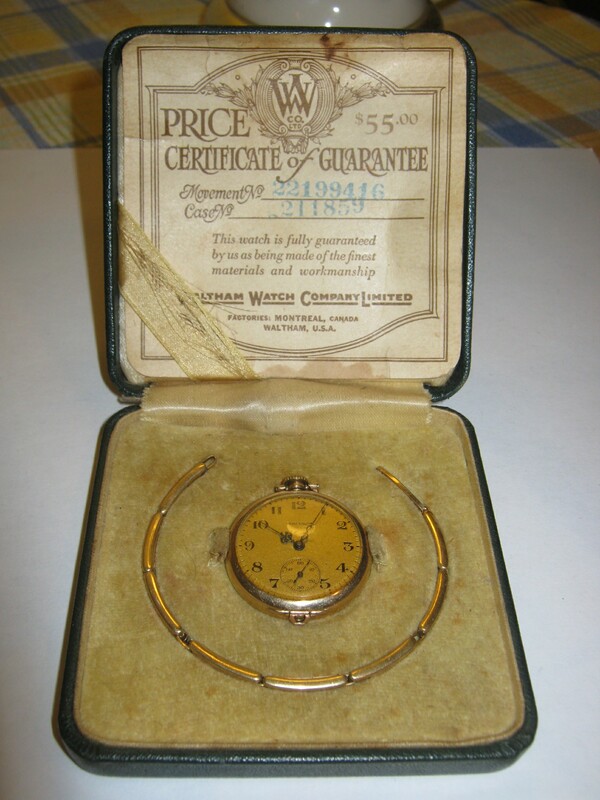 The Waltham Watch company was created in 1850 aiming to “form a watch company that could produce high-quality watches at a lower cost using interchangeable parts“. The company doesn’t exist any more, but it seems like they fulfilled their goal! This watch looks to be in perfect condition. It’s pretty impressive how the mechanism is still functioning as it did almost a hundred years ago. So, anyways, good start right? I promise the rest of the stuff is cool too! Last time I found a “treasure trove” I made one massive gallery which took forever and in the end probably took away from the items themselves, so this time I’m going to spread the stuff over a bunch of different posts. That is one cool watch my friend! What a lucky find! It sounds like you were walking in the right place, at the right time. Nice find, got under unusual circumstances. With an interesting slice-of-life story to boot (hope you get/post more details). I’m certainly looking forward to seeing the rest of the treasure. I was poking through a few relevant sites http://www.antique-pocket-watch.com/waltham-pocket-watch.html & http://www.oldwatch.com/identify/identify.html Who doesn’t love a pocket watch?! Wpw ! People are asking $1000-$1500 on eBay for these — and I don’t know if they even include the chain and box !